FFWPU USA: Right after the main event on May 254 in Manhattan center, a special memorial concert organized by True Mother was held as a tribute to True Parents’ son, Hyo Jin Moon, who ascended to the spirit world in 2008. 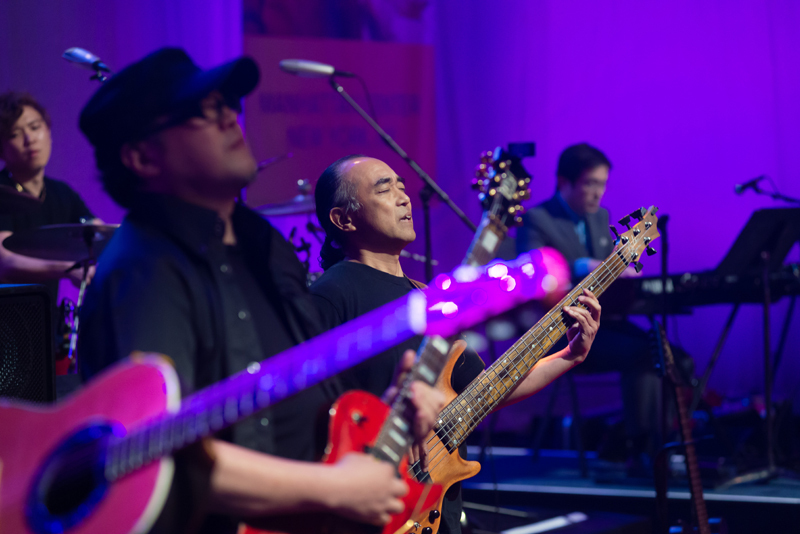 Featuring the Hyo Jin Moon band and Hyo Jin Moon’s three children, this performance was incredibly nostalgic, as it was held in the Manhattan Center, a place Hyo Jin Moon founded and where he poured out his heart and soul. The band debuted with one of Hyo Jin Moon’s songs, “My Last Prayer,” after an opening video of one of Hyo Jin Moon’s concerts. The video portrayed Hyo Jin Moon’s heart towards True Parents and our Heavenly Parent, his devotion and filial piety shining through his lyrics and electric music. The band began with a strong entrance and a male vocalist and guitarist who replicated and revived Hyo Jin Moon’s style and image during his concert days. His voice and presence on stage mimicked Hyo Jin Moon’s electric guitar solos and passionate energy. Another song was sung by a female vocalist, again embracing Hyo Jin Moon’s presence and style on stage. Both vocalists then sang, “Love You Forever Like Clean Spring.” All the songs performed were written by Hyo Jin Moon. A intermittent video was projected, highlighting the influence that media has on culture, and Hyo Jin Moon’s legacy with creating a heartistic culture. He established the Manhattan Center as a media platform to exponentially increase goodness into the world, wishing to transform people through music. He has written over 10,000 songs before he ascended to the spirit world in 2008 at age 47. After the video, to everyone’s surprise and delight, Hyo Jin Moon’s children appeared one by one on stage to perform their father’s singles. Each sang a selection of his music, right there on the Manhattan Center stage where their father performed so many times years ago. The first performance was by Shin Yuh Moon, the youngest of the three, who sang “Dol-I-Ai”. Her endearing and timid introduction warmed the hearts of the audience members. She thanked everyone for inviting the Hyo Jin Moon band and letting her sing on stage. She began with a big smile and sang sweetly and beautifully to her father’s song. Towards the end of her song, she displayed moving emotion in tearful remembrance of her father, yet stuck through to the end, moving the audience to their feet and drawing a standing ovation. Next, Hyo Jin Moon’s second son, Shin Heung Moon, introduced himself and acknowledged that this was “a meaningful day for us all.” He thanked the audience for going through the hardships that accompanied a life of following True Father, and then sang “Glory” with a powerful and passionate voice. The audience was able to resonate with Hyo Jin Moon’s voice through Shin Heung’s voice, and again rose to their feet in applause. The final song was sung by Hyo Jin Moon’s eldest son, Shin Chul Moon, who performed “Let it Blow.” This lively and upbeat performance compelled everyone in the room to stand, clap and dance along. Many Unificationists, young and old, streamed to the front of the room to dance mosh-pit style, waving their arms in the air and creating a vibrant, electrifying energy of joy and unison. As True Mother continues on her journey to Las Vegas, where the celebration will continue and the long-anticipated opening of the International Peace Education Center will be celebrated, the American Unification family feels revived, enthused, and deeply touched by True Mother’s words and the heart surrounding them. Stay tuned for updates on the 7-day Divine Principle Workshop in Las Vegas, and other events as we continue to welcome True Mother back to the United States.